Guest Post – Clarisonic? I want one too! Today I’d like to welcome Cas from Hair and Beautylicious, a great little blog that has been running for a few months now. This is Cas’s first ever guest blog post, and I’m very honoured to have her here today. Hello ladies **waves**, it’s Cas here from ‘Hairandbeautylicious’, and I will be today’s guest blogger, for the wonderful ‘Get Lippie’. I have decided to blog about a product that we all, lets face it ladies, want and that is the . . .Clarisonic. But I have discovered an alternative! Want to know more? Then read on . . .
A few years ago, as a present from my mum, I received a cleansing kit, which I originally thought ‘’what the heck is this’’. My mum kept banging on about how wonderful this kit was and that it would do wonders for my skin. As a ‘not so bothered’ teenager at the time, I kindly shoved this kit to the back of my wardrobe and thought nothing more of it. Following blogs, and the trends that seem to crop up from time to time in the wonderful blogging world, I came across a youtube video from a well known blogger discussing a Clarisonic. Filled with curiosity and feeling very intrigued, I decided to watch the video. By the end of it, I thought ‘’WOW, what a great machine’’ and then I had a light blub moment ’ding’. 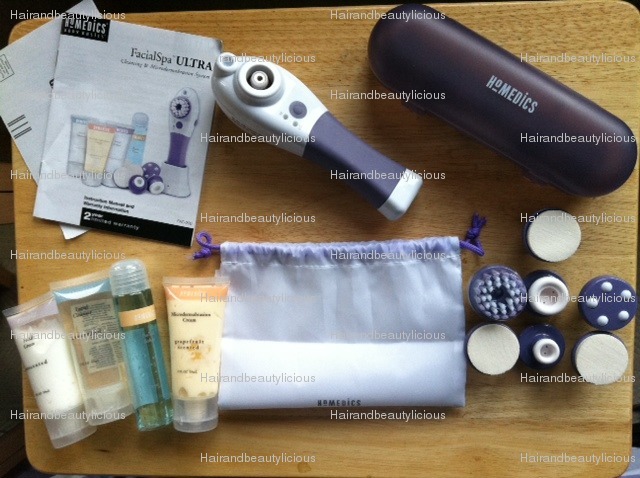 The kit I received a few years was in fact very similar, if not more or less the same as a clarisonic, that every girl in blogging world would like to own. I darted into my wardrobe, and found this neglected product that was looking back at me as if to say ‘’you’ve neglected me all this time, and now you want to use me’’ lol. Since its foundation in 1987, HoMedics has worked hard to achieve the number one name in health and wellness. We believe that nothing is more important than looking after yourself and we strive to bring you products that take the effort out of maintaining your wellbeing (Homedics, 2011). So you’re now wanting to know what came in the kit? well I am just getting onto that bit. This kit I thought contained a lot, which really does emphasise on the point that Homedics aim to achieve ‘’ We believe that nothing is more important than looking after yourself and we strive to bring you products that take the effort out of maintaining your wellbeing’’. Unfortunately due to receiving this kit as a gift from my mum, I cannot price it, and she also won’t tell me -_- lol. After several years of owning this product, but not actually putting it to good use, I decided to try it out, and to my astonishment, it works! YAY J After 16hours charging, reading from page to page of the manual, I decided to give this product a whirl, once and for all. Although the kit came with cleanser, toner and moisturisier and microdermabrasion products, I didn’t want to use them, as my skin is very very fussy, so I took to using good ol Liz Earle products and Aapri facial scrub to replace the microdermabrasion cream. At the end of this process, my skin felt incredibly smooth, soft and glowing. I have to say in the 10+years since I have been battling to maintain my skin and improve it, my skin looks so much better. It hasn’t instantly made it better, got rid of every blemish, but it certainly has rid away all the impurities and improved the general appearance of my skin. (Oh how I now wish I’d started using this product when I first received it lol). As illustrated in the above picture, this wand also carries a little mist sprayer. What is the point in that do I hear you say? Well once you have completed the process, it is suggested, in the manual to lightly spray your face with the sprayer, as this will close the pores. I have used this function a few times, and I think it works alright. Although I personally like to splash my face with cold water, as it’s less time consuming and then pat dry thereafter with a dry clean towel for face purposes only. 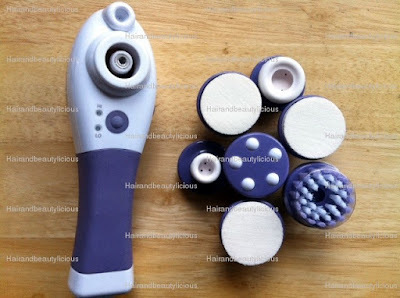 In comparison to the Clarisonic, which if I am brutally honest, is a product that more or less does the same as the product discussed in this review, I can imagine it was good value for money (although I do not know the exact price), and adheres to what the company sets out to achieve. Although I do not know how much this kit cost, I highly suspect that it did not cost in the region of £155 (current amazon clarisonic price), which for that amount of money, could easily go towards shoes, clothes, handbags, make up ;-). Although this product is no longer sold on the high street, and I haven’t seen it advertised elsewhere online, I suspect however there are other products similar to this that do the same task. If not by HoMedics, then possibly by another company. Will I continue using Homedics Facial Spa Ultra Cleansing and Microdermabrasion system? Yes, of course, until my ‘little find’ decides to shout ‘’I’ve had enough’’! Will I be investing in the Clarisonic in the future? While I have a product that virtually does the same task, no. However if a Clarisonic ever crossed my path, I’d be willing to, at least, give it a try to see what the difference between the 2 are. I do hope you’ve enjoyed my review. Don’t forget to check out my blog, which is ‘Hairandbeautylicious’, or tweet me at @H_beautylicious. Get Lippie says: I’ve had a quick look around the HoMedics site, and sadly, I can’t see this product listed on there any more, which is a real shame. I can’t be parted from my Clarisonic these days, and it strikes me that this would be an excellent replacement if – heaven forfend – the worst did happen … That whining noise you hear? That’s me praying that Monarch airlines haven’t lost my luggage, and my Clarisonic along with it ….